Our Wool Rug Cleaning Process Can Restore Your Ailing Rug Back To It's Former Glory! Here at Pro Care Cleaning we follow the same thorough, exhaustive wool rug cleaning process with every rug we clean. 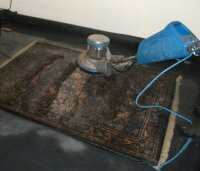 This process ensures the most complete and safe oriental rug cleaning possible. 1. Pick up or drop off! We offer pick up at your home or business or you can drop your rug off at our shop. We'll arrive at your home or business, pick up your rugs and load them into the "rug wagon", otherwise known as a Town & Country mini-van. We also utilize a 1-ton extended GMC 3500 van in our business, but it is so full of cleaning equipment there is rarely room for rugs in it! At that time, we can answer any questions or concerns you may have and discuss a tentative delivery date. 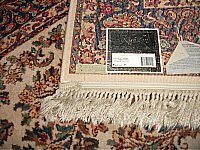 We carefully examine your rug, front and back, looking for any problems or areas of concern we need to be aware of. Conditions such as structural damage, dye problems, insect damage and repairs are noted. 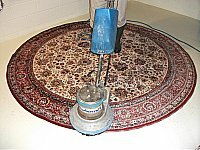 The cleaning process is adjusted (from cleaning solutions to temperature of cleaning solutions to forms of agitation to dwell time) in order to provide a safe and thorough oriental rug cleaning process for your rug. The next step in the oriental rug cleaning process is to test the rug for dye stability. This is done by applying small dime sized samples of all the different cleaning solutions that will, or possibly could be, used during the cleaning process. Next, a white cotton towel is placed over the sample sites and it's weighted down. The towel is left overnight and checked the next morning for any dye transfer. 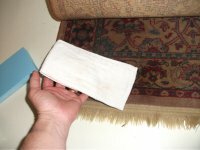 The results of the test will tell us how wet we can safely get the rug and which cleaning agents are safe to use on it. As you see in the picture to the right, all three of these rugs tested completely safe for immersion cleaning with all of our cleaning agents. 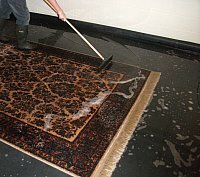 Before any rug gets the least bit wet, it is vacuumed and dusted thoroughly. A single rug may be vacuumed and dusted multiple times before wet cleaning. It is not unusual for us to spend 30 minutes performing these tasks. We will continue this procedure until we have removed all the dry soil we practically can. Now it's time to get the rug wet! The first step is to apply a citrus based co-solvent to the rug and to any fringes. The co-solvent has two purposes. First, it's a safe degreaser. Secondly, it functions as a surfactant, helping us to thoroughly wet out the rug. The next step is to shampoo the rug, front and back. The shampoo can be applied through a pump-up sprayer and agitated by hand with a rug brush, or it can be applied with a rotary machine through the shampoo tank. Now is the perfect time to perform rug fringe cleaning. We hand detail the fringes before putting the rug in the rug bath for further cleaning and rinsing. The next step is a full-submersion rinsing. We have our rug bath set up so there is laminar water flow from back to front as well as water flow through a hand rinsing tool. 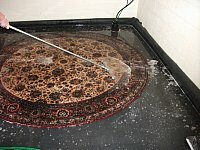 The rug is rinsed from the back and the front. This rinsing procedure can be repeated as many times as necessary to rid the rug of any undesirable contaminants and odors. As we drain the rinse water in the rug bath we periodically squeegie the excess water off the rug. This final step in the rinsing cycle is where the rubber meets the road. If we can see any evidence of additional soiling still present in the rug, then we wash it again. We will not return a rug to you that is not completely clean. After rinsing and squeegieing the rug, it's extracted to remove all the water we can. Most rugs are extracted three to four times before being hung for drying. 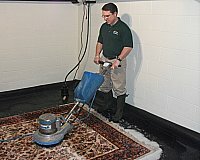 After extraction, all rugs are groomed to set the pile properly. Wool rug cleaning, properly performed, should not result in a rug showing "wand marks" or "chevrons" in it's pile. A wool rug is not the same as a broadloom produced residential carpet, and it shouldn't be treated the same either. Extra care exhibited through steps like these is the difference between professional wool rug cleaning and amateur cleaning. After the rugs have been thoroughly extracted they are carefully hung for drying. We utilize multiple air movers and dehumidifiers in order to achieve the fastest dry times possible. 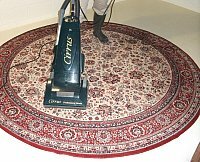 Fast drying not only means you get your rug back sooner, but the more quickly we dry your rug the safer it is for your rug. Drying is the most overlooked part of professional wool rug cleaning. Our ability to avoid problems like shrinkage, browning of the fringes, dye migration, and odor problems are all directly related to our having an efficient drying process in place for your rug. 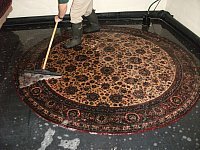 Click Here To See Why Cleaning Oriental Rugs Is So Different From Regular Carpet Cleaning! Questions? Comments? Click Here To Go From Our Wool Rug Cleaning Process Page To Our Contact Page. Who Are We? Click Here To Go From Our Wool Rug Cleaning Process Page To About Us!